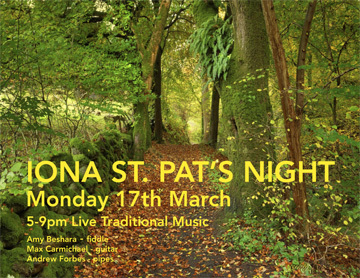 Iona St Paddy’s coming up this Monday 17th, a nice mellow 5-9pm trad music time with lovely people at the best bar in Billyburg. The wicked good fiddler Amy Beshara is leading, ably supported by Andrew Forbes on pipes and Max Carmichael on all the instruments, 180 Grand Street at Bedford Ave, L, M and G trains. May your dreams be green. Éirinn go Brách! Alba gu bràth!